Readers at 2013 AQ Yearbook Launch Party and Reading. L. to r. Susan Carey, Lucien Knoedler, Bryan Monte, Kate Foley and Robin Winckel-Mellish. Susan de Sola missing. Friday, 13 December 2013, Amsterdam Quarterly (AQ), launched its 2013 Yearbook at the American Book Center in Amsterdam. 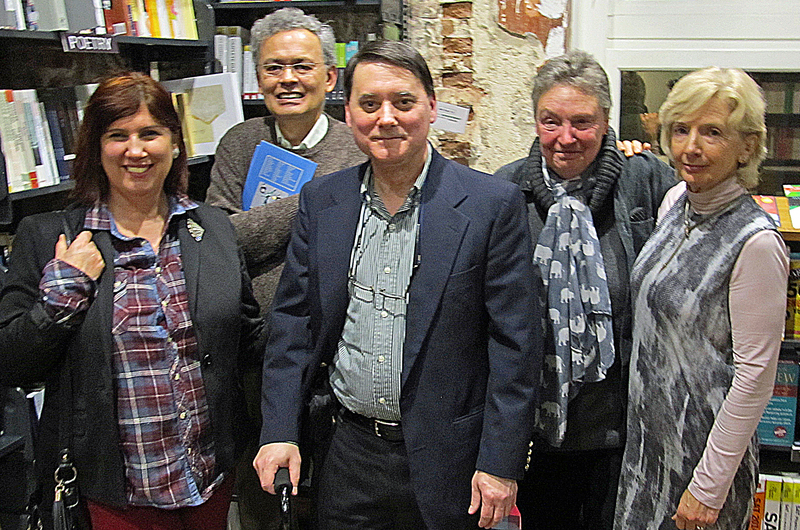 The event included wine, nibbles and fiction by Susan Carey, memoir by Lucien Knoedler, and poetry by Kate Foley, Bryan Monte, Susan de Sola and Robin Winckel-Mellish. The launch party and reading concluded with yearbook signings. The AQ 2013 Yearbook features drama by Jim Dalglish, interviews with Joan Z. Shore and Edward Mycue, photography by Rink, and poetry by Kate Foley as well as 26 other contributors’ essays, fiction, memoirs, photography, poetry, reviews and translations. The yearbook also includes some pieces written and/or translated into English, Dutch or Afrikaans. Amsterdam Quarterly was founded in April 2011 as a tri-quarterly, online, literary magazine and an annual, printed, literary anthology. AQ’s goal is to publish, promote and comment on writing in Amsterdam, the Netherlands and the world. AQ’s spring 2014 issue on families of blood and choice will include an exclusive interview with David Sedaris and a memoir by Neil Hughes. Submissions for the spring issue will be read during January 2014 and should be sent to submissions@amsterdamquarterly.org. Consult the AQ website at www.amsterdamquarterly.org/contact/submissions/ for further details.